This is an easy Infor VISUAL tip! 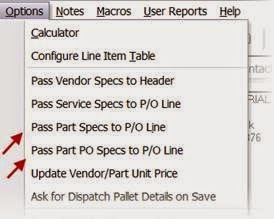 If you link POs for work order material cards, and you want the specs on the work order material card to get passed to the purchase order line, just uncheck both of the spec options. Now the requirement specs will flow to the line item! This tip was brought to you by BizTech VISUAL Consultant, Paul Turnberg.